The last variation of the week draws inspiration from that wonder of the baking world, Jim Lahey’s No-Knead Bread. The principle there is that time does practically all of the work for you, stretching the gluten out slowly instead of having to knead it at all. 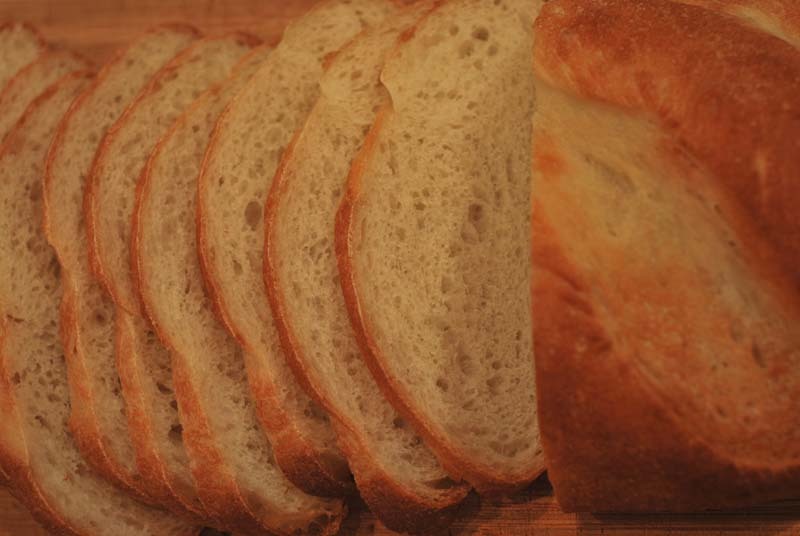 It also gives the yeast time to produce as much lactic and acetic acid as possible, which vastly improves the flavor and keeping qualities of the bread. Knowing that time is one of the most important ingredients in the best breads, I decided to give my dough as much time as I could manage in a day. In order to do that, I needed to reduce the amount of yeast I used. A quick word about yeast: those little guys will keep on growing and multiplying as long as the temperature stays within a certain range (not too cold or too hot), and as long as they have food. That means that even a few grains of yeast will leaven all the dough in the world, given enough time. Thinking logically, if x amount of yeast leavens the dough in 1 hour, then to leaven the same dough in twice as much time, 2 hours, you would need to halve the amount of yeast. Less yeast, more time. So to leaven my dough in 4 hours would require x/4 amount of yeast, or 3/8 teaspoon in this case. But would it really be that simple? There was only one way to find out! Yes, it was really that simple, she said, doing away with any suspense. In fact, it was spot-on. In four hours, my dough was perfectly risen, and actually smelling quite delicious. But unlike a typical straight-dough method, where the first and second rises take the same length of time, this time the second rise took less time than the first, as the yeast had multiplied by then, and needed less time to produce the same leavening. But the real test came in the tasting. And boy, was it worth the wait! This was definitely the winning variation! The texture was just perfect, soft and supple, while still being appropriately chewy. The crust was thin and crisp, and was a beautiful golden color. And the flavor! So delicious! The autolyse method had produced the most complex flavors so far, but this blew that away. It wasn’t more sourdough-y, as I thought it might be, nor was it more robust, it was simply better. It was really, really excellent! You can absolutely use this method to adapt any bread recipe, which will surely improve the flavor and texture of your favorite loaf. One caveat with trying it, though, is that your dough should not be fully kneaded, as the gluten continues to develop throughout the long rise. If you knead what might otherwise be a proper amount, the gluten will eventually stretch out too much, and snap like a rubber band, resulting in a dense and tough bread. Also, reduce the amount of flour slightly, as a wetter dough will produce a much better result. So ends an exciting week in bread! I’ve really enjoyed getting to know my methods better, and seeing exactly what they all do in my dough. For me, I can read pontifications on the subject from now until doomsday, but it doesn’t really hit home until I can actually taste the difference for myself. In the end, the best way to get as much flavor as possible from your four simple ingredients is to just give them time, either through a short autolyse, or with a long rise, if you can. A combination of the two would probably work miracles, healing the lame, turning water into wine, and all that. Here’s hoping you’ve learned as much as I have this week, and can start utilizing some of these methods to improve your own bread! Happy baking! 1. In the bowl of a stand mixer, whisk together all but a handful of the flour and all of the yeast. Whisk in the salt. Add the water and mix with the dough hook at low speed until a rough dough forms. Scrape the bowl if needed, and increase the speed to medium-low and knead for 3 to 4 minutes, or until the dough forms a cohesive ball, and becomes slightly elastic. This dough should be a bit under-kneaded. If the dough does not form a ball, add the reserved flour until the proper consistency is achieved. The dough should be rather slack. 2. Turn the dough out onto a lightly floured surface, and knead a few times, forming the dough into a round ball with a skin stretching over the outside. Transfer to a lightly oiled bowl, smooth side up. Cover and let rise in a warm place until doubled in size, about 3 to 4 hours. 3. Line a large baking sheet with parchment paper. Gently deflate the dough, and turn out onto a lightly floured surface. Flatten the dough into a slight rectangle or oval shape. Fold the two corners furthest away from you into the center of the dough, as though you were beginning to fold a paper airplane. Starting with that point, roll the dough up into a cylinder, pressing gently to seal as you roll. Press the final seam to seal. Transfer the dough to the prepared baking sheet, seam-side down. Tuck the ends under if desired, to make a more attractive loaf. Cover loosely with lightly-oiled plastic wrap, and let rise until doubled in size, about 1 1/2 to 2 hours. Thirty minutes before baking, preheat the oven to 425º F, and place another baking sheet or oven-safe pan in the bottom of the oven. If you have a baking stone, heat it with the oven. If not, your baking sheet is fine. 1. If using active-dry yeast, you should increase the amount to 1/2 teaspoon, and your water should be a bit cooler, around 105º F to 115º F. Instead of mixing the active-dry yeast into the flour, you should dissolve all of it in a little of the warm water, in the mixing bowl. Let stand for about 5 minutes, or until foamy. Add the flour and salt, and proceed as directed. So when are you making something with wild yeasts? I think instant yeast, while handy, really limits the flavor that will develop. Belinda: Back in March, I did make a true sourdough, with wild yeast. I totally agree, it really does vastly improve the flavor! There’s nothing quite like it. I use baker’s yeast partly out of personal convenience (I am making 6 different breads a week! ), but also because that’s what most people have on hand. One of my goals with this site is to take away the notion that breadmaking is difficult, and I think many people are intimidated by recipes that take over a week to create, no matter how good the result! Thanks much for the comment, and happy baking!